Folks, if you ever need proof that the studios knew exactly what was considered salacious back in the day and added it to their films to bring in the crowds, Parachute Jumper is the film for you. It’s all here, everything from toilet flushes to Frank McHugh flipping people off, and with a game but slightly lost Bette Davis in the middle of it, during her platinum blonde early days when she was still flashing glimpses of herself in nothing but a slip. Douglas Fairbanks, Jr. is Bill Keller, and he and his buddy Toodles Cooper (Frank McHugh; who else would play a guy named Toodles Cooper?) are former Marines out looking for work. They stumble across Patricia Brent (Bette Davis), also looking for work. She’s from a small town in Alabama, hence her nickname, and cute as a button, so Bill invites her to stay with them, to at least share the rent. She agrees, and wacky hijinks ensue. What a font! Just look at those Es! Eventually Bill makes some money as a demonstration parachutist, though the job scares Alabama — and given the state of aviation in 1933, her fear seems perfectly reasonable to me — so he tries to find less neck-breaking work. He ends up in the employ of a drug-dealing gangster’s moll, and does more than just drive her around, if you know what I mean, and I think you do. But when Alabama accidentally applies for a job as secretary to the gangster himself, without knowing he is not a legitimate businessman but rather a “legitimate” “businessman,” Bill completely loses his cool. 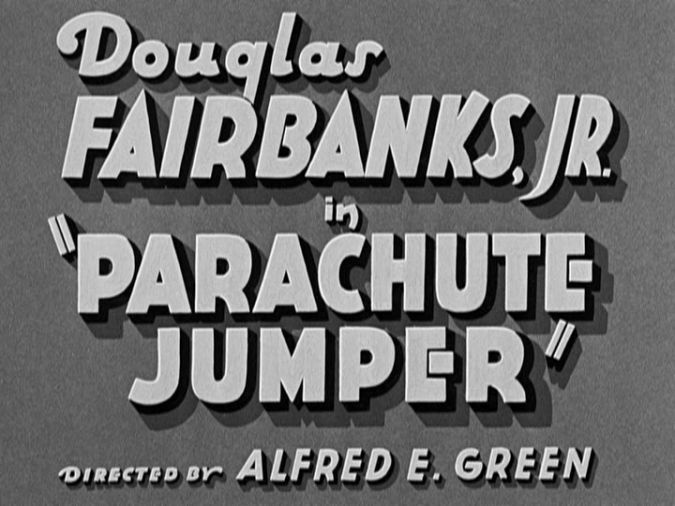 As someone with a mild Douglas Fairbanks, Jr. allergy, I found him more than tolerable in Parachute Jumper, and Frank McHugh is at his Frank McHughiest. The plot is mostly inconsequential — everyone is out of a job and wacky things happen as they look for work — but it’s conducive to being played for laughs, and that’s more than you can say for a lot of deliberately edgy pre-Codes. Warner Archive’s copy is very nice, and appears to be the same print TCM plays on occasion, and though it shows a couple of spots where you can see there was significant deterioration, it’s been restored enough that it’s barely noticeable. This film is a lot of fun, and if you like your pre-Codes grungy and funny, you’ll like Parachute Jumper. 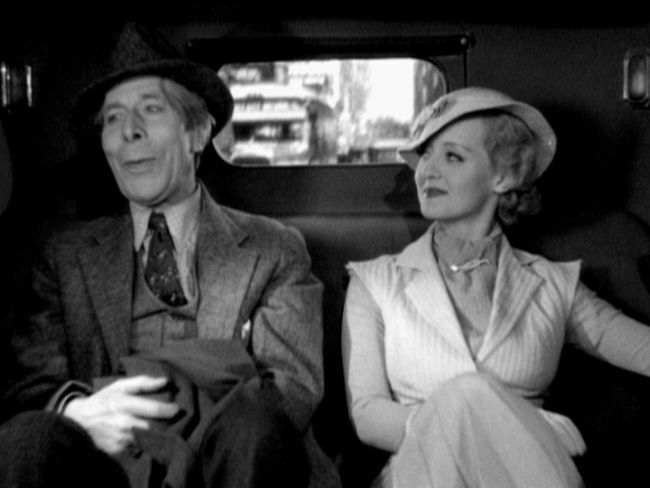 Bette Davis’ first film with her mentor George Arliss, the highly creepy The Man Who Played God, turns out to have only been slightly less creepy than their second outing, The Working Man. Though Bette spoke highly of Arliss and his assistance in her career, she simply does not work well with him on screen, and tends toward old-fashioned acting tricks rather than the more modern, energetic performances that became her trademark. In The Working Man, Bette plays Jenny, an heiress whose parents, owners of one of the largest shoe manufacturing concerns in the States, have both passed on, thus the family fortune is shared by her and her brother Tommy (Theodore Newton). 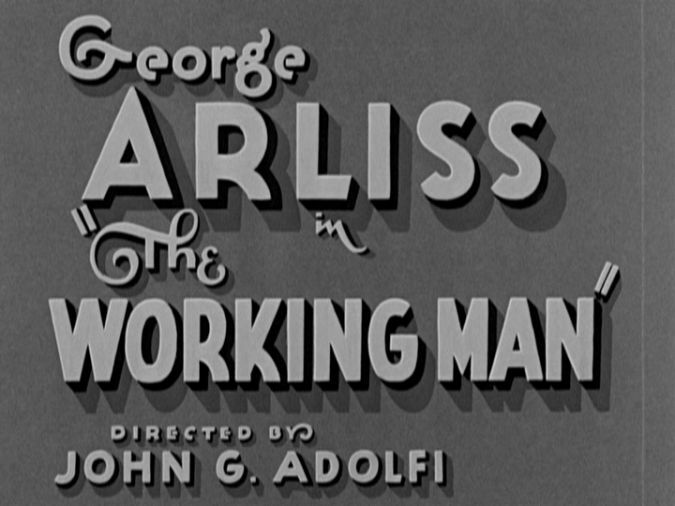 Arliss is Reeves, owner of the largest shoe manufacturer, and he is appalled at how hedonistic Tommy and Jenny are. The problem is that their hedonism isn’t actual hedonism, not even by 1933 standards: yacht parties where a pinochle game gets out of hand, and champagne from a bootlegger for soirees at home. Reeves decides they must be taught a lesson, so he pretends to be a “regular guy” and infiltrates their home, and with the help of more than one sitting judge, tricks the siblings into signing over management of their estate to him. Once they do, he goes from being happy-go-lucky friend to judgmental jackass, refuses to give them their own money, and shames them into working for a living. Now, the problem here is that they are supposed to be too young to legally manage their own estate, yet somehow are old enough that not ever having had a job is some kind of mortal sin. And let’s not forget that their parents never made them work nor showed them the family business; it’s entirely possible their parents’ wishes were for them to enjoy themselves, at least for a while. Arliss may have been a fine stage actor, but he’s freakish on the silver screen, unable to not look straight at the camera and constantly playing to the rafters. He’s unappealing, and everyone else in the film is clearly secondary to his own ego. He’s a bland whirlwind, taking over a scene because he thinks it’s his due, and acting protective of the actresses he appointed himself mentor to, which is fine and dandy, but he does it during the film when it’s out of character. 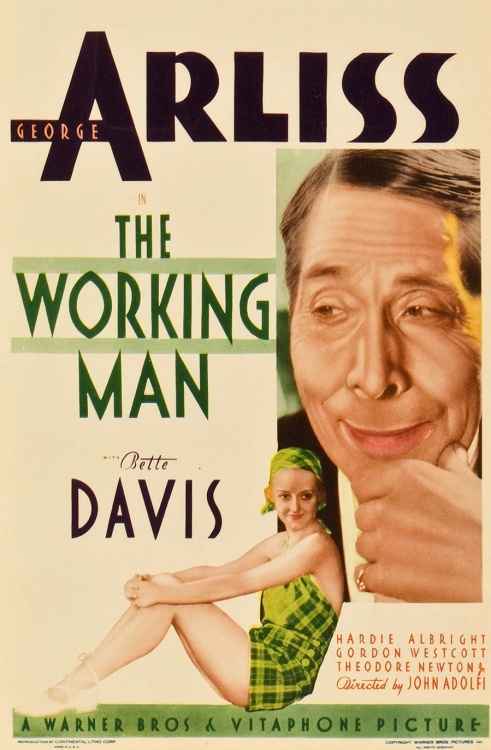 The Working Man is not a particularly bad film, but my patience is sorely tested by George Arliss. If you don’t suffer from Arlissitis like I do, you should check this film out. It’s not a pre-Code despite the publicity’s reliance on party scenes and champagne glasses; it’s more of an anti-pre-Code, a moralistic tale. The print is nice, on par with the Parachute Jumper print, and the MOD DVD looks nicer than the TCM version I have which was recorded off several years ago. Thanks Geino! 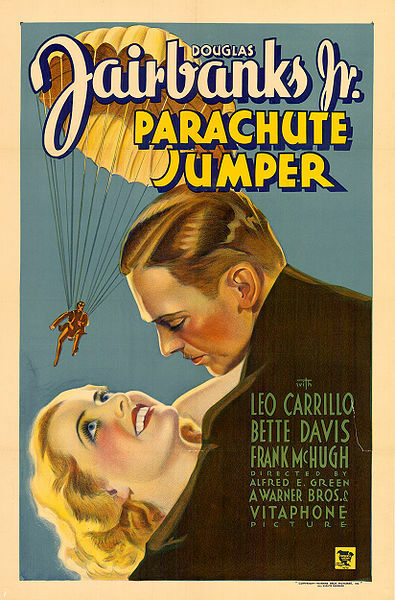 PARACHUTE JUMPER is just crazypants pre-Code shenanigans all the way through. I started a post on it a few months before Warner Archive released their copy, and I hope to work on it soon, or at the least include something more in-depth about it in an upcoming piece I’m writing for another outlet. If BEYOND THE FOREST makes it to DVD in any format you will hear me cheering across the land. I can’t tell you definitively why it hasn’t made it to DVD yet, but several years ago I was told that there are rights issues with the Stuart Engstrand estate, though I have no details beyond that.